Oh, we've met this fantasy writing lady before and lived to tell about it. Continuing our Context 22 blitz, the Werepig parties with JACKIE GAMBER! One of the driving forces behind the award winning Meadowhawk Press, Jackie is here to talk about her book REDHEART and what you can do to stop Specism through her support group HADS (Humans Against Dragon Stereotypes)! AND...tonight's fiction giveaway, the short fiction collection of Rob Dunbar, Martyers & Monsters. 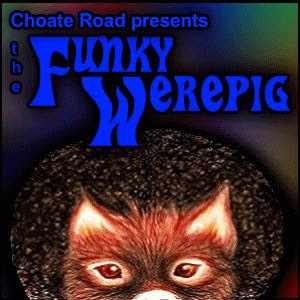 It's all here tonight at The Funky Werepig. For Harry Keogh fans, the wait for more of the original Necroscope's adventures ends with “Necroscope: Harry and the Pirates”. Featuring three never-before-published-in-the-U.S. Harry Keogh tales, it's a worthy addition to Lumley's sprawling bibliography. All the key elements are there: Lumley's trademark, storyteller's voice, his wit and the original Necroscope himself, Harry Keogh. Though the title story “Harry and the Pirates” isn't quite as engaging as the “For the Dead Travel Slowly”, and “Old Man with a Blade” is little more than a footnote, this is still an excellent buy for Keogh fans everywhere. In “For the Dead Travel Slowly”, Harry has returned to his childhood hometown in the County of Durham to visit his childhood pal, James Collins. The Necroscope is tired and defeated after spending fruitless years searching for his lost wife Brenda and his son, whom Brenda disappeared with soon after Harry's strange skills came to light. Harry is very rarely alone, however – though the company he keeps isn't always desired, for Harry possess the dubious ability to speak with what he calls the “Silent Majority” - the dead, lying in their corpses, waiting to move on. Though he's come to James' house looking for rest, work always lingers for the Necroscope. He senses something lurking in the woods nearby, a massive collection of the dead, crying out for release. How is it related with the constable he discovers lurking on the woods' outskirts one day...and the lonely, bedraggled man Harry stops the constable from beating? Something ancient and hungry creeps through the woods. Not only does it feed on human flesh, but it also harvests their souls and holds them captive. Harry must work quickly to unravel it's mystery, because soon enough...it will be time for the centuries-old abomination to spawn, creating more of its terrible kind. 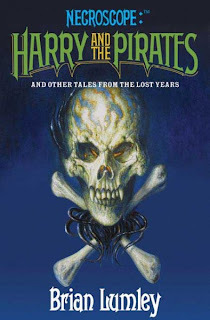 “Harry and the Pirates” is an amusing enough tale, though not as engrossing as “For the Dead”. In it, a disillusioned Harry – weary of searching for his lost wife and son – encounters a pirate's soul while hanging around the shipyards of Hartlepool. The tale the pirate has to tell – of grief and suffering, of betrayal and riches – is engrossing, to say the least, but like so many of the dead Harry has encountered over the years, this particular soul is hiding something. It's not what it seems; in fact...it may never have been human, to begin with. The final piece of this collection is short, but hints that Harry's work is far from done. In “Old Man with a Blade”, Death himself encounters Harry, and muses on the Necroscope's fate, which is not to fall at his hands...or in this world, even. A bit of a teaser concerning the Necroscope's ultimate future, perhaps promising more adventures to come. Visit www.brianlumley.com. Buy it today. What is Necon? Countless of philosophers have pondered this existential question for ages, (since Necon's conception nearly thirty years ago), and have reached several conclusions. Some believe it a meeting of like-minded individuals sharing their love of the written word, the spooky, fantastic, horrific and terrifying. Others describe it as an annual festival with feats testing the strength, courage, (and perhaps livers), of speculative writers in ways rivaling those of the Nordic gods. Some have even referred to it as a “Hippie Love-in Fest for Writers”. Also, the collection offers insightful essays on the history and meaning of Necon, from the hilarious – and possibly hallucinogenic – essay by Matt Bechtel., to others by Charles F. Grant and Thomas Monteleone, with fabulous artwork from Gahan Wilson, Glenn Chadbourne, Richard Sardina and Cortney Skinner. And, of course, one cannot forget the “Necon Lexicon”, as read at Necon 29 by Doug Winter. That alone is worth the price of admission. Don't wait. 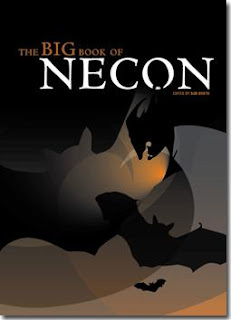 Sign up for Necon 30, and so you have a chance of surviving the experience, get “The Big Book of Necon” today. Visit www.campnecon.com and www.cemeterydance.com/page/CDP/PROD/booth01 today. Do you know the difference between true Lovecraftian fiction and “Derlethian” fiction? Are you aware many of the Lovecraftian tales reproduced on the Internet may not be complete, accurate renditions of his original works? Also – how much does Lovecraft borrow from other ancient cultures and religions, most notably Egyptian, to craft his otherworldly pantheon? And, if a Yuggoth lived in upstate New York and you encountered it, would you know what do; better yet...would you even care? 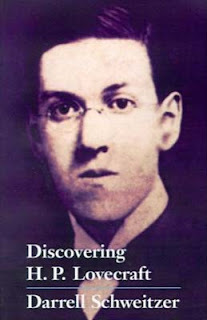 Depending on your answers to the above questions, (and how willing you are to risk the inevitable madness that comes from probing questions of the dark unknown), “Discovering H. P. Lovecraft” is the forbidden tome for you. A collection of essays edited by author and former editor of Weird Tales Magazine, Darrell Schweitzer, this is an excellent, in-depth, insightful but user friendly reader that will acquaint fans of speculative fiction with one its most notable founders, Howard Phillips Lovecraft. With essays from Schweitzer himself to Robert Bloch, Lin Carter and the esteemed S. T. Joshi, this collection is a necessity for those wishing to further educate themselves in the career, beliefs, and philosophies of Lovecraft. 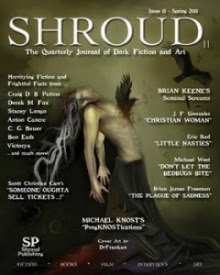 Perhaps the most useful essays are “Some Thoughts on Lovecraft”, by Arthur Jean Cox, “Genesis of the Cthulhu Mythos” by George Wetzel and “The Derleth Mythos”, by Richard L. Tierney. The last two of those are perhaps the best essays in the collection, because the former deals with how Lovecraft may have created his pantheon by drawing heavily from ancient Egyptian lore, and the latter perhaps the best essay overall, simply because it highlights something not necessarily well known to the casual Lovecraft reader; the marked difference between Lovecraft's vision and the themes that friend and colleague August Derleth (noted author and founder of Arkham House Books), injected into the Mythos after Lovecraft's passing. “Character Gullibility in Weird Fiction; or Isn't Yuggoth Somewhere In Upstate New York”, by editor Darrell Schweitzer is by far the most humorous essay in the collection but deeply insightful, also. Here Schweitzer ponders on how gullible weird fiction protagonists should be, and if they should “figure out” their plights too quickly or not. He also wonders if modern Lovecraftian storytellers allow their heroes to wallow in madness long enough before coming to their solutions. A good reference for those wishing to add their own myths to the Lovecraftian tradition. Interested in Lovecraft and want to know more? Bothered by strange sounds at night, coming from the pond near your house, and wondering what that thing your weird uncle mumbles when he's asleep in the armchair - Ph'nglui mglw'nafh C'thulhu R'lyeh wgah'nagl fhtagn! - means? Discover H.P. Lovecraft today. Visit www.fantasticfiction.co.uk/s/darrell-schweitzer. Buy it today.